Meal Notes: At some point over the years, I seem to have lost my taste for traditional, syrupy take-out-style sweet and sour chicken,* but this baked version has remained one of my all-time favorite recipes. It leans more towards the sour than the sweet and ditches deep fried dough in favor of a light glaze. Add rice and you’ve got an easy, delicious dinner for 4. Source: Modified from a very old Better Homes & Gardens cookbook that, unfortunately, seems to be out of print. Prep: Preheat oven to 420 Degrees F. Dice chicken, bell pepper, and tomato. Slice mushrooms. Drain can of pineapple chunks. Line a baking sheet with aluminum foil for easier clean-up. Make Sauce: In a small saucepan, combine cornstarch and water. Add all remaining sauce ingredients and cook, stirring over medium heat, until the mixture thickens and bubbles. Remove from heat. Prepare Chicken: Place diced chicken, bell pepper, and tomato, sliced mushrooms, and pineapple chunks on prepared baking sheet. Drizzle half the soy mixture over the contents of the baking sheet and use a spatula to mix everything together. Spread chicken, vegetables, and pineapple evenly over the surface of the baking sheet. Bake chicken: Bake for about 20 minutes altogether, or until chicken is cooked through. After about 10 minutes of baking, give the contents of the baking sheet a stir and drizzle the second half of the soy mixture over everything. Serve over rice. 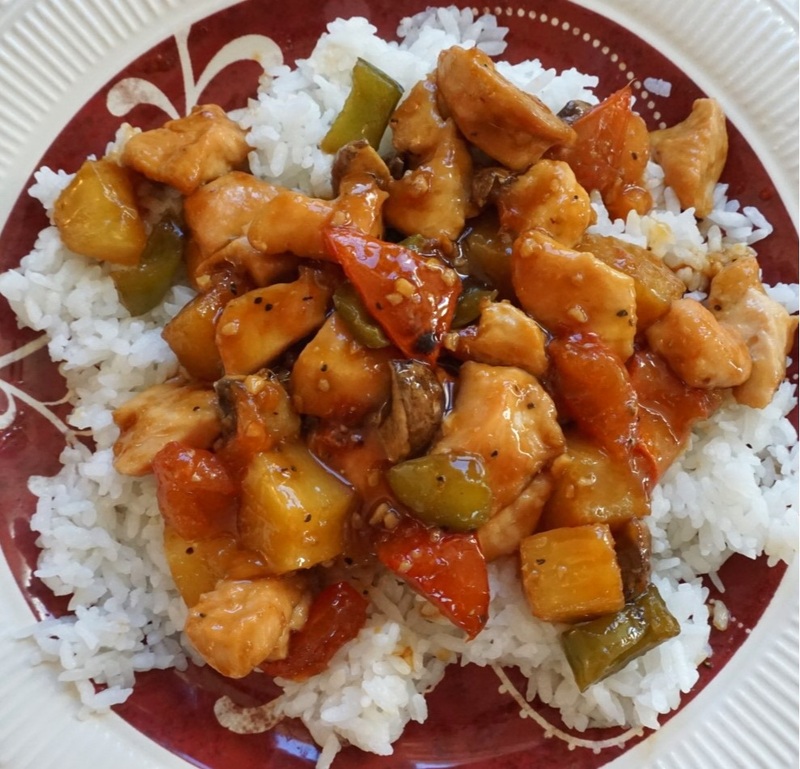 *”Traditional” Sweet and Sour Chicken: The “traditional” version of sweet and sour chicken that Americans are accustomed to ordering as take-out is not, in fact, traditional to Chinese cooking. While sweet and sour sauce has existed for centuries, it’s relatively rare in authentic Chinese cuisine and more often used as a dipping condiment than a sauce to slather over entire meals. The original version is also lighter in both consistency and flavor, with additions like ketchup, canned pineapple, and white vinegar (as opposed to rice vinegar) making their way into the sauce only as San Francisco and New York Chinatown restaurants began catering to Western palates in the 1900’s.